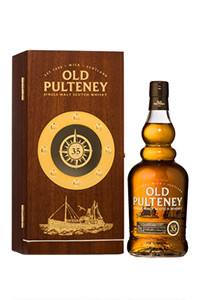 June 23, 2014 – Old Pulteney is releasing a limited-edition 35-year-old version of its single malt Scotch, with just 450 cases to be made available worldwide. In a news release, Inver House Distillers described the new expression as a combination of ex-Bourbon American Oak and ex-Sherry Spanish Oak casks. It is being bottled at 42.5% ABV. The release follows a 2012 launch for Old Pulteney 40 Year Old from the distillery in Wick, which is the northern-most distillery on the UK mainland to have released a single malt so far. The Wolfburn Distillery is north of Wick in nearby Thurso, but has only been distilling spirit for 18 months and has not released a bottling yet. Recommended retail pricing for the Old Pulteney 35 is £500 ($855 USD) per 70cl bottle. There will be a 75cl version for the US market, but pricing has not been determined yet. Editor’s note: This story was updated with additional information.